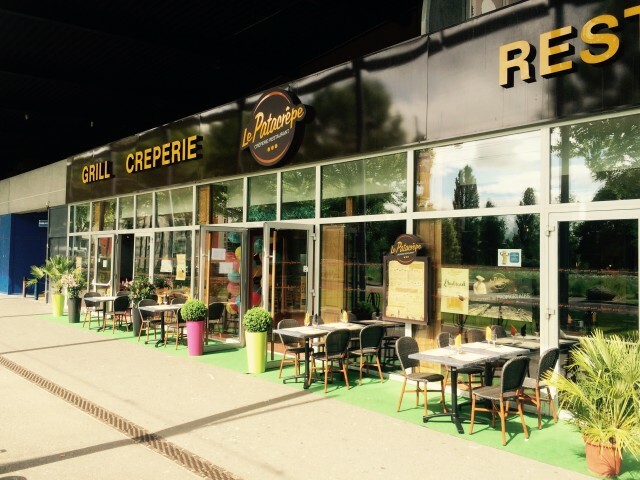 Open since 2012, located at the bottom of Kinepolis, the Patacrêpe restaurant Mulhouse done and always will delight fans of gluttony. Young and old will be delighted with the wide variety of pancakes, burgers, salads and fries, all HOMEMADE. It's rare enough to be underlined, the Patacrêpe franchise is the only restaurant chain in France labeled "home made", ie that all the products are made ​​in the restaurant's kitchen. The Patacrêpe also emphasizes fresh fries especially that nowadays it becomes difficult to enjoy fresh fries in restaurants. The new manager held a fry shack in the north "a real ch'ti". A little advice, do not stop with the savory crepes because our sweet crepes are a true delight ,. The decor is to discover a bicentennial olive tree is located in the middle of the restaurant, the decor of the restaurant is breathtaking. For our little kids, a real bouncy castle where they can spend lavishly and let mom and dad romantic dinner. Most conscious online can also have fun with the many gourmet salads offered by the card. Meat lovers will also not be disappointed with duck breast or steak! At lunchtime you can enjoy affordable menus: + dessert from € 9.90. Good and fast food is, while controlling its budget! Désomais the pancake Mulhouse "the Patacrêpe" has a terrace to come enjoy our crepes and our dessert. COME QUICKLY !! Reservations at: 03.89.59.21.43Ouvert 7/7 - continuous service ! !